The magic part of the magic crystal Christmas tree is partly how quickly the crystals grow and partly the whole notion of a paper or sponge tree magically sprouting crystal foliage. This project is a variation on the charcoal crystal garden, except the crystals are grown on a tree form. You can watch a time lapse video of this project to see what to expect. Make the magic solution by dissolving the salt in the water and stirring in the bluing liquid and the ammonia. There are ​a couple of different ways you can go here. You can cut a sponge into the shape of a Christmas tree, set it in a shallow dish, and pour the crystal solution over the sponge. Set the dish someplace where it won't be disturbed. You can dot the sponge with food coloring (like ornaments), if desired. Depending on the temperature and humidity, crystals may start to appear on the sponge Christmas tree in less than an hour. You should have a nice set of crystals if you let the dish sit out overnight. The other method is to cut out a cardboard or blotting paper Christmas tree. If you make two of these trees, you can cut one halfway down the top and the other halfway up from the bottom, match the cut ends together, and create a standing 3-dimensional tree. You can decorate your tree with food coloring ornaments. 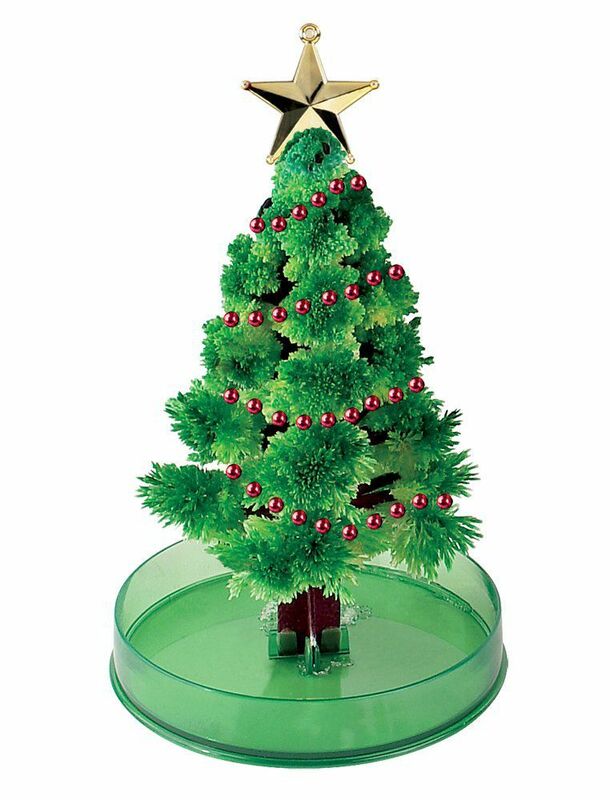 Set this tree in a shallow dish that contains the crystal growing solution. Crystal 'leaves' will start to grow on your tree as the liquid is wicked up the paper and evaporates. If you can't get laundry bluing, you can get inexpensive kits to grow magic crystal Christmas trees.